edges of electronic music since 2004. 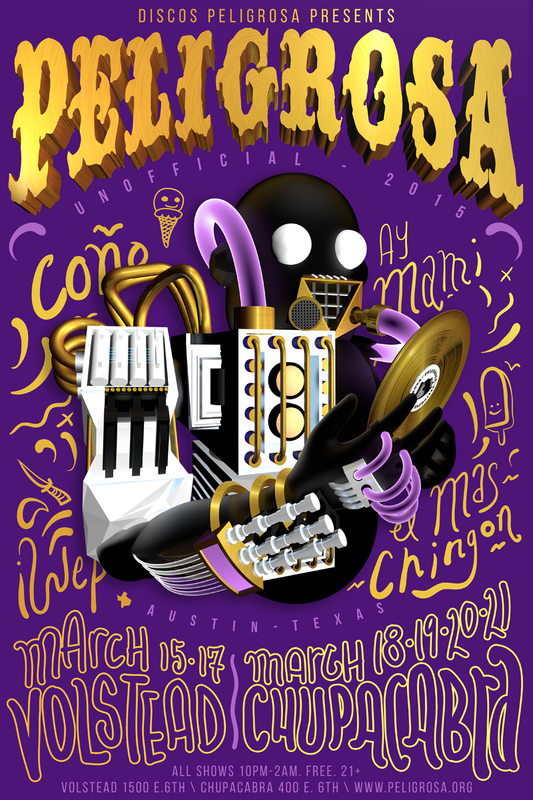 Super psyched to be joining Peligrosa crew in SXSW this year! Amazing vibes, can’t wait to be there. Check out my man Orion in his interview with KarmaLoop from last year’s fest. First mix of the 2015 Kid Kameleon season is out. A deeper, more head-noddy affair than I was expecting to make, but it’s just how it came out. There’s something about the grinding, inexorable synths that has just been doing it for me ever since some of the classic Om Unit stuff of 2011 – this was finally a way to pull a lot of that stuff together. That’s the part that I’m calling #FutureWave. Then I’m trying to weave it into both the Com Truise sound and the digital cumbia I’m really in to a the moment. I think of it as the soundtrack to a psychedelic drive through the American Western Desert – I truly hope someone uses it for just that! Download link here. The one and only Julien Mier has put out my favorite release of the year so far. Mier’s stuff gets better with every passing month, and this is his best work yet (complete with amazing art reminiscent of Hayao Miyazaki). Full of heart and soul, passion and creativity. A butterfly crossed with a raven. Would expect nothing less from France’s Cascade Records. My Finnish friends Recue and Jolea have self-released their EP We’re Not Like The Most. So happy to see it out. They’re even doing a vinyl for it! Recue X Jolea – Knives Are Falling (Studio live for Sunnuntaikooma radio show 10 years special) from recue on Vimeo. Favorite track of the latest Low Riders release, last one for the year. A great way to go out. 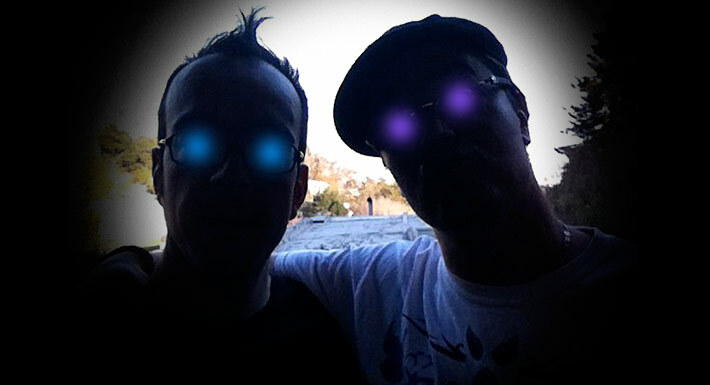 First video for old friend Anthony Pateras in collaboration with Mike Patton is out on Wondering Sound. Listen below. Poster kind of says it all – I think this is the first time I’ve had a character of myself drawn. 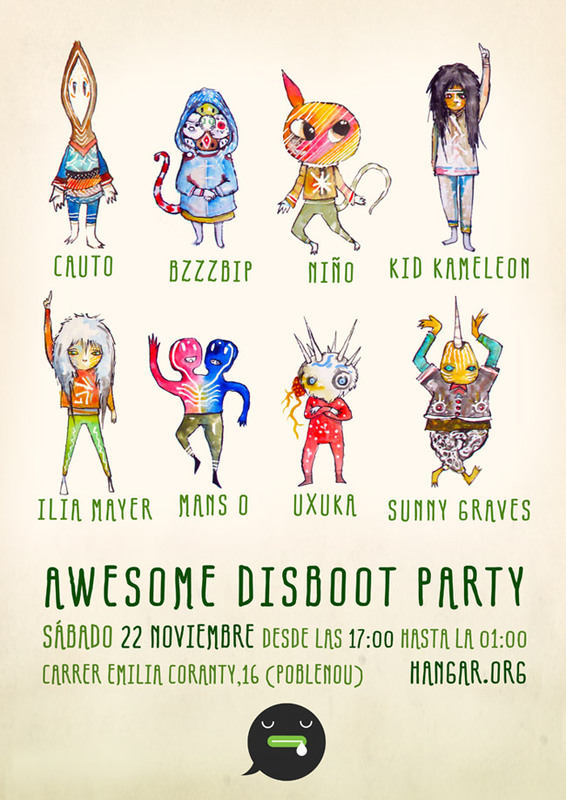 🙂 There is so much great music coming out of Barcelona, it’s astounding, but Disboot has been there at the heart of it all for a long time. Truly honored. Super happy to be playing with Tinker at the Dokfest Lounge in Kassel on the closing night of the film festival. If you happen to live in Kassel, come out, should be a great show with 6 projection screens! ILUMINA from LUIS SANZ on Vimeo. Super happy to see a new album from old homie Thriftworks – looks like it’s going to be the first of THREE this month! Beautiful, complex, melodic beats – making me miss California. You can pick up almost everything he’s ever done on his Bandcamp. Truly eclectic album from avant roots Barcelona duo Pulshar just out – pick it up here. All kinds of glitchy, dubby sounds stretching across the tempo spectrum. Also check out their stellar Echo Chamber mix above. The incomparable Mauoq is back on Absys records! One of the most original voices in DnB over the past several years. My buddy Hatim is doing a crazy new project with the makers of Blend.io where people get to remix his video and audio clips. Read all about it here! Can’t wait to see what people make with this stuff. Construxon Time Again from Adam Brown on Vimeo. Finally out! Been watching this get built (construxted?) over the last year. Just in time for Jacob 2-2’s newest release The Rec. Never fail to find something interesting on every EE release – this time it’s Chandeliers. Dub Mission and my crew from SF Surya Dub participated in the RBMA Culture Clash last week. Sounds like a blast – they didn’t win but were strong contenders. Read the ForwardEver recap of the event.